Hi, I am growing a moustache this year for Movember. I have decided to put down my razor for one month (November) and help raise awareness and funds for men’s health – specifically prostate cancer and depression in men. What many people don’t appreciate is that close to 3,000 men die of prostate cancer each year in Australia and one in eight men will experience depression in their lifetime - many of whom don’t seek help. Facts like these have convinced me I should get involved and I am hoping that you will support me. Remember, all donations over $2 are tax deductible. Movember is now in its sixth year and, to date, has achieved some pretty amazing results by working alongside The Prostate Cancer Foundation (PCFA) and beyondblue: the national depression initiative. 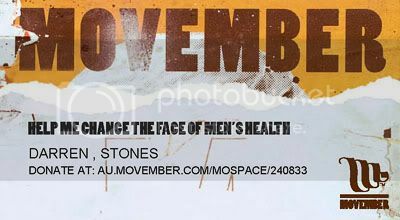 Check out further details at: http://au.movemberfoundation.com/research-and-programs. If you are interested in following the progress of my Mo, click here: http://au.movember.com/mospace/240833/. Also, http://au.movember.com/ has heaps of useful information.